I was born in Belfast 1948 and brought up in the circle of the Lyric Players Theatre, at the time a small semi-professional company which specialised in Irish verse drama and especially in the plays of W.B. Yeats. 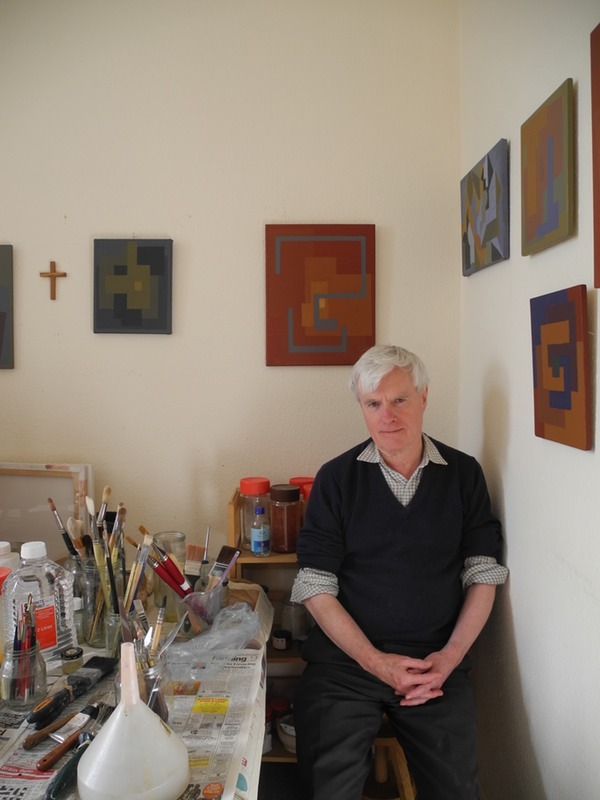 I had the privilege of knowing a number of Belfast painters, notably Alice Berger Hammerschlag and Neil Shawcross. In 1964 I attended a Summer School in the Collège Cévenol in France where I met the painter and poet Walter Firpo who first introduced me to the work and thinking of Albert Gleizes. I went to Cambridge both as an undergraduate and, later, to write a doctoral thesis on Controversies in Ulster Presbyterianism, 1790-1836. Awarded Ph.D in 1980. In the early seventies I became involved with the British and Irish Communist Organisation, writing for their Belfast news bulletin, Workers Weekly and for the Irish Communist. Like Philip O’Connor on his Facebook page I consider this - in particular conversations with Brendan Clifford - to have been my real university. In 1987 I went to France to pursue my interest in Gleizes, both in the practical application of his principles as a painter and in the wider theological implications of his thought. In particular, I engaged in a large project of translating Gleizes’ writings and of cataloguing archives. I worked with the potter Genevieve Dalban, pupil of the Australian potter and close associate of Gleizes, Anne Dangar. As Secretary to the Association des Amis d’Albert Gleizes I published a series of pamphlets with texts by Gleizes and by his close associates. While in France I joined the Orthodox Church through Fr Quentin de Castelbajac of the Russian Church Abroad in Lyon. I returned to Brecon in 1999. Initially most of my time was taken with looking after my father, though I also gave a series of lectures for the WEA in Brecon and Llangynidr on differences and similarities among the world religions. Since my father died in 2006 I have been concentrating my efforts on painting. My project can be divided into two parts - 1) a strictly non-representational painting based on Gleizes's principles of 'translation' (stability) and 'rotation' (mobility) and 2) an attempt to use the same principles of construction for painting based on the iconography of the Orthodox Church. Exhibitions of my work were held in Wolfson College, Oxford, in February 2010 and in November 2015. Numerous articles in the 1970s and 1980s mainly on political questions in e.g. Workers Weekly, Irish Communist, Fortnight, Linen Hall Review, Honest Ulsterman, New Statesman, Labour & Trade Union Review. More recently I have had lengthy articles published in the online review, Dublin Review of Books (on Richard Dawkins, Michael Foot, Solzhenitsyn, WB Yeats and the Maynooth Patristics Symposium) and, with particular reference to the visual arts, in The Art Book (on the potter Anne Dangar and the weaver Jacqueline Dürrbach). I have also recently contributed articles to The Heidegger Review and to the Irish journal, Church and State. Many of these articles can be consulted on my website. 'Religion & Science in Nineteenth Century Belfast' in J.C.Beckett et al: Belfast - The Making of the City, Belfast (Appletree Press), 1985. Major study on Ulster Presbyterianism - The Historical Perspective, 1610-1970, Dublin (Gill & Macmillan), 1987 - republished Belfast (Athol Books), 1994. 'Albert Gleizes - Another Way of Cubism' in Mainie Jellett (exhibition catalogue), Irish Museum of Modern Art, Dublin, 1991. Assisted the Irish author Bruce Arnold in the preparation of his book Mainie Jellett and the Modern Movement in Ireland, Yale University Press, 1991. Deux Peintres Philosophes - Albert Gleizes et Kasimir Malévitch and Quelques Réflexions sur la Littérature Actuelle du Cubisme, both Ampuis (Association des Amis d’Albert Gleizes) 1995. Afterword and notes for Fr Desiderius Lenz: The Aesthetic of Beuron and Other Writings, Francis Boutle publishers, London, 2002. 'Du "Cubisme" et les débuts du "modernisme"' in Serge Fauchereau et al: Gleizes - Metzinger - Du Cubisme et après, exhibition catalogue Musée de la Poste, Paris, May - September 2012, Lodève, June-November 2013. 'Wiktor Poznanski i wystawa L'Art d'aujourd'hui z 1925 roku' in Jaóbcyk, Kuropatwa;Pik, Pawlak (eds); Imperium rodziny Poznan´skich, Museum Miasta Łodz, Łodz 2012, proceedings of a symposium in the Museum of the City of Łodz, 15-17 October 2010. 'Cubism in the Paris of the 1920s' in Sean Kissane et al: Analysing Cubism, exhibition catalogue, Crawford Art Gallery, Cork, 2013. 'The Council of Frankfurt and the Seventh Ecumenical Council' in The Beauty of God's presence in the Fathers, Proceedings of the Eighth International Patristics Conference, Maynooth, Four Courts Press, Dublin, 2014. 'Reflections on movement as a function of painting' in Grace Weir - Three different nights, recurring, Dublin, Irish Museum of Modern Art, 2015. 'La succession de Moly Sabata' in Anne Dangar - Céramiste. Le cubisme au quotidien, Exhibition catalogue, Musée de Valence, 2016.